I was one of the lucky ones in February, able to score numerous skeins in Sundara’s Cruisade against Winter Gloom. Throughout the first half of the month Sundara had several updates of Limited Edition yarn (meaning the colors offered she came up with while stretching her artistic muscles, and would never be available again). And with only 10 skeins (at most) of each color available, you had to have a quick internet connection to bring most of the lovelies home. One of my favorites is called Acorn Squash. 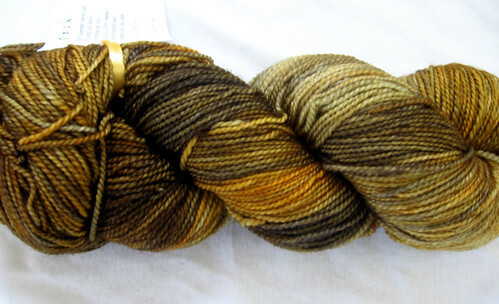 Beautiful shades of browns and golds, but it had not been re-skeined after dyeing. You can tell it hadn’t been re-skeined because the colors bunch up together. 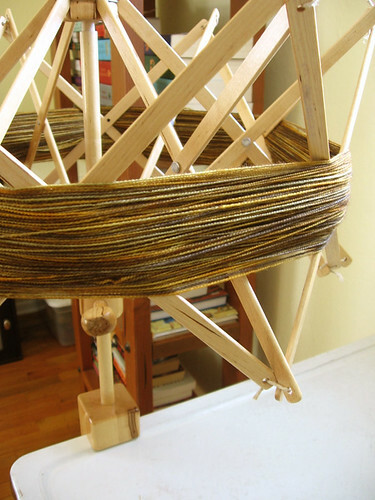 One of the benefits of re-skeining yarn is that you have a better idea of what the yarn will look like when it’s knit. 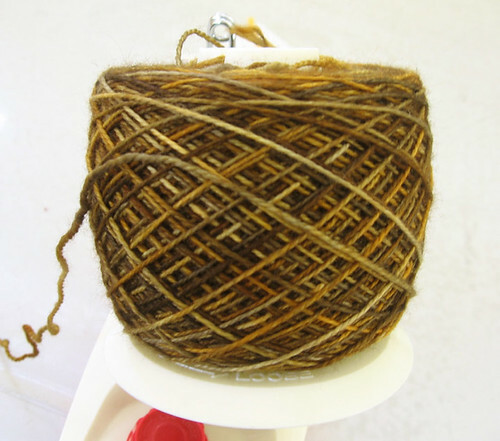 It’s not going to come out like the skein above – all the different shades are not uniformly going to line up. I’d never re-skeined yarn before, so I thought I’d try it with this skein. Since I don’t have a Niddy Noddy, I had to improvise. I wound the skein onto my ball winder. Then wound it back onto my swift, which causes the colors to redistribute. I twisted it back up into a skein, and ended up with this! I think I love it even more now. Whay would they sell it before it was re-skeined? Is it cheaper to buy like that? Colors are very nice! Oohh, I’m drooling over the color. I just found your blog via Ravelry and read past posts. 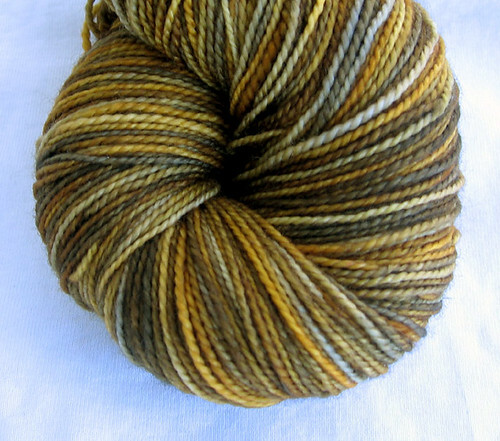 (actually I just emailed you about your fearless fiber sock yarn Marrakesh!) I really like the ankle socks you made for your brother. The color is great. What pattern did you use or did you just alter an existing one? I’d like to make a pair for my husband.